Native American Flute and Drums along with the Australian Didgeridoo and the African Djembe with guitar and piano. Featuring Charlie Crow Dog Myers and introducing eleven year old Emily Ruth Thomas. 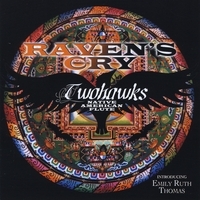 Raven's Cry is Twohawks third album in his discography. The album title was inspired by Suzi Raven's Cry Rice of the Wolf Creek Cherokee Tribe. The album consist of thirteen original songs. Young Emily Thomas an 11 year old student of Twohawks is introduced on the album and plays two solo flute songs as well as "Nevermore" a duet with Twohawks. Also appearing on the album is Charlie Crow Dog Myers who plays the Australian Didgeridoo on two outstanding tracks Shapeshifter and Raven Medicine. The album is loaded with wonderful Native American flute music and percussion from large Native American Mother Drums as well as the African Djembe. The album is Contemporary/Traditional Native American Flute Music in Twohawks, unmistakable, style. This is an album you are going to want to listen to again and again. Wonderful ambient sounds to accompany the Native American Flute make this an outstanding album. The music on this CD was beautifully done. It is calming and spiritual. CD to everyone. Two Hawks has out done themselves on this CD. Very poignant music - enjoyed it very much. I have listened to all of the music put out by this artist. Each album has its own unique sound and this one is no exception. In my opinion, this is Twohawks best album to date. The rhythmic tones and harmonies of the album really pull you into a sense of tranquility and well being. I love how he integrates the use of the Australian Didgeridoo into his songs giving it a stronger cultural feel of not only the native american people but the natives of other countries in our world. You would really be missing out not to pick up this album. Love the album. The blend of instruments is beautiful. The flutes are played not only with skill, but with feeling. It's hard to name a favorite; they all touched me. Excellent! Listening to various tracks evoked tears, drama, sweetness and haunting dreams. The duet Nevermore was a lovely conversation between two flutes. Shadow on Canyon Walls actually gave me some toe-tapping moments. Raven's Medicine was a tribal feast! It is panoramic enough to be a movie soundtrack! Raven's Cry was a complex experience: It reminded me of the traditional Flight Song and a lullaby at the same time. It is such a heartfelt piece, it was as if bells were tolling while dreams needed kindling. The combination of several flute keys, the drum, and didgeridoo seemed the apt background for Twohawks' song-writting talents. The music seems to flow from the souls in concert, an ensemble that showcased the power of song, not just to enjoy, but to experience. Raven's Cry is Twohawks best work yet ! The natural and haunting sounds of the flute are beautiful, the songs are so pleasing to the ear that one tends to want to play it again and again. The introduction of the featured young artist, Emily Ruth Thomas, is amazingly mature, I have no doubt that she wil continue to grace us with her talents for many years to come. wow is the first word that comes to mind. i have both of twohawks albums, this is even better and those were great. i cant belive emily can play that well at age 11. charlie crow dogs works make the album complete,and one of the best flute cd,s i own.